Is learning about art through tablets the future or a clever gimmick? Ask most people how often tablets are used in museums and the answers vary wildly. Some seem to think they're attached to exhibits as a way of displaying information. Others think they have nothing to do with the experience, and should stay that way to prevent more screens getting in the way of exhibits. However, some people (especially those who don't frequent exhibitions all that often) assume that everyone is walking around museums and galleries holding an iPad, laughing freely as they absorb reams of information from the magic information portal in their hand. It would make sense – many people have a tablet now, and the internet has been spewing out information about cultural goings-on for a long while. However, dig a little deeper, and you'll see the tablet revolution is a long way from hitting your local museum – it takes a strong developer and a real defined sense of the experience they want to create to make it work properly. With that in mind, T3 headed to the newly-built Fondation Louis Vuitton (FLV) gallery in Paris, where children are being encouraged to interact with art through the use of an iPad app. Upon arrival, parents can get their child an iPad mini (with a heavily shockproofed bumper case on the back to prevent slips and falls) to cart around, with the aim of making the exhibits more fun and engaging. The app – created by developers Touchpress - is designed to help children learn about the building, rather than the exhibits – partly because the app was developed before the exhibit was opened, but also because it gives the children a different perspective that they can share with their parents. “If you're a parent, you're unlikely to be an expert in every institution you visit. Kids can be interested very easily if you're able to tell them a story or point something out, you can engage them really quickly, but their initial response is usually 'Oh god, not another museum',” said Louise Rice, Touchpress' executive producer. 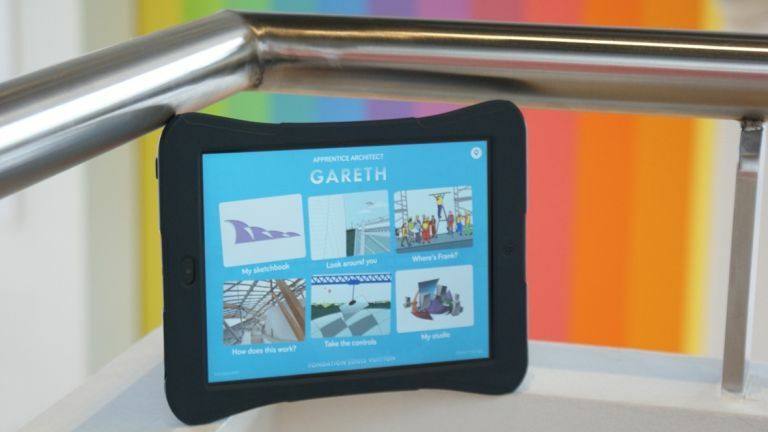 The app is simple to use and gives children different games to play, from placing glass using a crane to a 'Where's Wally'-style puzzle where you try to find key members of the museum's staff, learning about their roles on the way. It's here that the the iPad's interactivity comes to the fore: zooming into the screen to hunt for the next target, or using the accelerometer to place glass, is an entirely different experience to a colouring book and some pencils. “We really tried to immerse ourselves in what we're trying to achieve [when building this app],” said Rice. “First we had to work out and understand the building, the journey the architect would have been on – in this case, the notion that Frank Gehry took a scribble on a napkin to the amazing structure here. Where do technology and art meet? The worry that art enthusiasts have is legitimate. While it's great to have a child at an exhibit that isn't running around screaming through sheer boredom, giving them a screen just reinforces the idea that there's something better to look at. So how do you develop an app that can cater to the needs of children without taking away from the experience? “It's things like asking kids to find a picture so they have to find it,” says Rice. “It's about finding ways in which they need to look up and see the real objects to properly engage. The app itself definitely feels like the first stage of a project. While it's good to get a sense of the building's history, it feels odd to not get any information on the exhibits themselves. If the same experience was extended to art, it would really add something to the tour. The good news is that this idea is being tested – and not only at the FLV. Rice told me that Touchpress has been experimenting with technology like iBeacons (which transmits location information to iPads, triggering information on the relevant exhibits) and that the company could use these to create other apps around the FLV in the future. In other institutions, like the British Museum, it's not as easy, thanks to the heavy Victorian walls and the difficulty in finding unobtrusive places to keep the beacons. But at the FLV there are loads of easy places to stick iBeacons – they could even be part of exhibitions if the right artist was involved – so the idea of using tablets in spaces like this to enhance the experience could become the norm, rather than a clever way of keeping kids occupied. Like this? Why not read our feature on the best tech hotels in the world?